A 15-year-old boy presented to the A and E department with weakness and pins and needles in both arms. He gave a history of fall from a household trampoline in hyperextension 3 days before presentation. He reported neck pain on the previous day. This was followed by pins and needles and numbness over the shoulders, which progressed down to the arm and forearms. On examination, there was patchy sensory loss in both upper limbs, with decreased power of 4/5 MRC. Lower limb examination was normal. Decreased power in the upper limbs was worse distally than proximally. There was no spinal tenderness. In the next 24 hours, he developed difficulty in voiding urine, difficulty in walking, worsening gait, and additional sensory involvement of lower limbs. Forty-eight hours after presentation, he was quadriplegic, with power of 3/5 MRC in the limbs, elicitable reflexes, no sensory level. Superficial pain, temperature discrimination was lost bilaterally with relative preservation of light touch, vibration, and position sense, and his bladder was catheterized. Magnetic resonance imaging of the spine showed linear high signal within the spinal cord extending from C4/C5 to C7levels [Figure 1], and was diagnosed as acute spinal cord infarction. After weeks of inpatient neuro-rehabilitation, he is making slow but steady progress. Spinal cord infarction in children has been recognized for several decades, but remains rare and difficult to diagnose. No reports of spinal cord infarct caused due to trampolining were found in the literature. 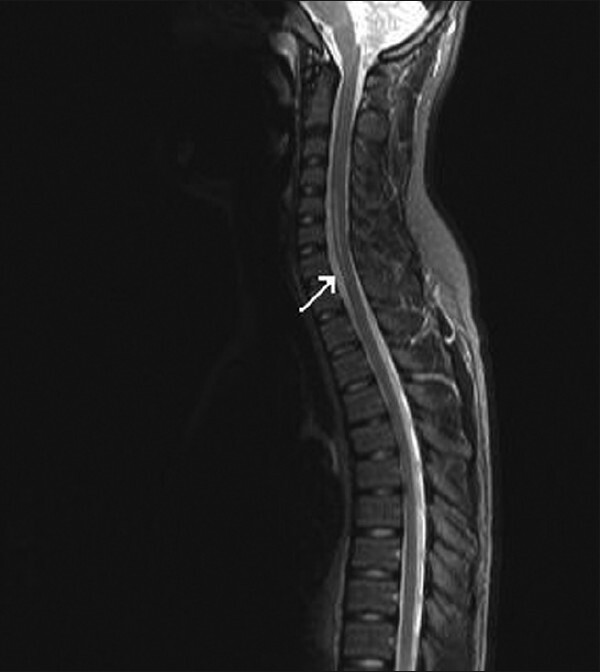 There are several differentials for acute flaccid weakness with sensory symptoms, including acute transverse myelopathy, viral myelitis, Guillain-Barré syndrome, and mass lesions in the spinal canal, which can develop acutely but have discernibly slower evolution than the vascular lesion like spinal cord infarction. Pointing toward the diagnosis were acute presentation, pattern of weakness, sensory symptoms, lacking a sensory level on the body, loss of pain and temperature discrimination with preservation of vibration and joint position sense, and involvement of sphincters. 1. Nance JR, Golomb MR. Ischemic spinal cord infarction in children without vertebral fracture. Pediatr Neurol 2007;36:209-16. 2. Available from: http://www.rospa.com/leisuresafety/adviceandinformation/leisuresafety/trampolinesafety.aspx. [2011 Aug 12]. 3. Wootton M, Harris D. Trampolining injuries presenting to a children's emergency department. Emerg Med J 2009;26:728-31. 4. Bogacz A, Paterson B, Babber A, Menelaws S, Drew T. Trampoline injuries. How to avoid injury. BMJ 2009;338: b2197. 5. Leonard H, Joffe AR. Children presenting to a Canadian hospital with trampoline-related cervical spine injuries. Paediatr Child Health 2009;14:84-8.